Today was a good day. In addition to meeting with some smart minds about artisan entrepreneurship, I had the opportunity to plan a pitch event for would-be entrepreneurs and meet with an existing business owner who desires to invigorate his enterprise. His business is real estate–specifically residential sales. What he’s hoping to accomplish is to build a powerhouse brand that competes statistically with the leading agents in our community while targeting an under-served niche market. He asked me about my philosophy on how to accomplish his goal(s). Everyone knows that Social Media is on the rise and important to reach niche audiences in engaging conversations. What I was able to point out to this entrepreneur is that social media is a subset of Content Management Marketing. Knowing what messages you want to get across is a precursor to sharing the right information through online channels. To begin making posts, tweets, updates, etc without in-depth knowledge of target prospects and their needs is like wearing a blindfold in an archery contest. Whether it is your strategy as an agent to build your business through referrals from prior clients, key centers of influence, or new campaigns, it is unwise to get spread too thin and not have deep relationships. Given the huge number of users on many social networks, the agent must devise a strategy that isolates niches and pursues them with targeted strategies. 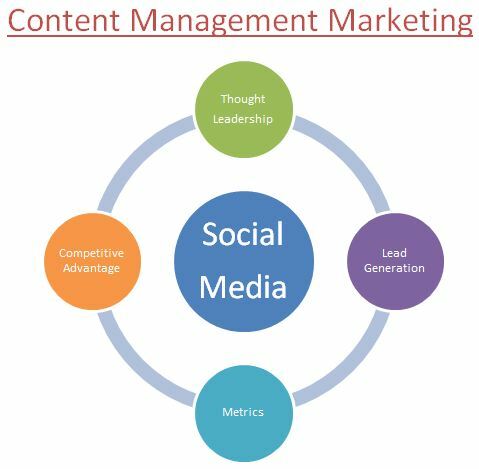 The diagram shows that thought leadership is obtained by creating great content that is shared through social media. In response, the various media provide a built-in feedback loop that should drive future thought leadership strategies. For instance, some agents provide insights in multiple categories for their target audience(s). Whether it is local community, national real estate trends, the agent’s own interests, or local real estate content, the point is to demonstrate that you know what you are talking about. Lead generation is the holy grail for many agencies that advise real estate firms. They think that, if they can generate enough new prospects for the agents to pursue. they have earned their keep. However, as the agent with whom I was meeting explained, leads that are not qualified and filtered can waste a lot of time. Smart lead generation comes from site visitor capture initiatives that are driven by a content management system that relies on social media to create online experiences for web fans. Having worked in marketing roles for multiple services firms, I have met many peers who are entirely comfortable being creative, attending wine and cheese events, and spending the money of the business owner(s). What many of them lack are measurement systems (metrics) that validate the marketing ROI. Furthermore, when metrics are available (web analytics come with every website), the marketers often don’t use the information to change the messaging and means of communication. Smart agents know better and use metrics to verify that what they are doing is working. Competitive advantage is what is so hard to achieve, yet worth the pursuit. It is that unique place where the audience you target perceives that you can solve their needs “better” than any other provider. “Better” means that the home buyer/seller connects with the agent on a personal and professional basis and feels that the fee they pay to be represented is a value that exceeds what else is available to them. What is your Content Management Strategy? Do you have one? ← Do Your Cultural Diligence in M&A!